The Buhari Administration at the weekend declared that there are ongoing plans to implement one of its striking campaign promises that it will pay N5000 each to the poorest Nigerians across the country. Vice President Yemi Osinbajo who gave the hint noted that government is “currently evaluating the best ways to collapse existing cash transfer and social welfare schemes to ensure consistency and alignment. “Once this is completed, we will implement the first phase of this program, using recognized identification platforms and transparent payment solutions”, he added. 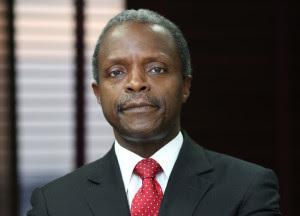 Osinbajo who disclosed this at the 10th Year Anniversary Lecture of Crescent University, Abeokuta, Ogun State titled, ‘The Nigerian Economy and the Future’, also said the federal government has identified the weak transmission grid, which prevents the wheeling of more than 5,000MW as a gridlock to be removed. He assured that the Buhari administration would work with the distribution companies to ensure the necessary investment to get electricity to consumers is in place. On the pervasive poverty ravaging the country, Osinbajo said the payment of N5000 each to poor Nigerians was necessary because “we cannot talk about the economy of the future without addressing how we move people out of poverty. The Vice President observed that the level of poverty explains much of the Nigerian situation because it affects all aspects of life,including why over a million Nigerians die yearly of preventable diseases. “It reflects in our alarming rates of infant mortality and maternal deaths at childbirth. It also tells why so many children of school age are out of school and why so many adults lack access to healthcare and proper vocational training; why, in effect, they are less efficient and less productive at work”, Osinbajo noted. Giving a succinct analysis of the nation’s economy, the VP said, “The vexed questions of the day pertain mainly to the economy. What is the real state of affairs? With so much reliance on a single commodity, how do we survive in an era of oil glut and falling commodity prices? “With so many indications of waste, corruption and impunity, how do we set our economy on the right path? With so many unemployed, how do we offer hope and sustain the enthusiasm of our children still in school? And with so many of our consumer goods imported from abroad, how do we continue to live well without going bankrupt? Indeed, what is the place of Nigeria in the African and World Economy?” He further queried. He lamented that, while many public servants were being owed arrears of salaries across the country, many traders are experiencing a downturn in sales. “Artisans abound, whose businesses cannot thrive without power supply and many of our youths are searching in vain for employment”, the VP added.